Welcome to Day 6 of the Consequences Audio Tour! If you’re in a hurry to listen to Chapter 6: THE WHORE WHO WORE TURQUOISE, run to DIRTY BAD BLOGGERS RIGHT NOW! Me: Run run to DIRTY BAD BLOGGERS to find out! If you have a few minutes… let me introduce you to the DIRTY BAD BLOGGERS, aka Jenn and Morgan. So… Dirty Bad Bloggers—do I need to tell you what kind of books they like to read and review? Or why, when I found out about their blog, I HAD TO HAVE THEM ON BOARD? It’s not often that you find your soulmates out in the Cyber-Ocean, so when you do—you’ve got to grab them and hold onto them with all ten of your toes. Right? Dirty Bad Bloggers host some amazing giveaways and contests on their FB page, so make sure you check them out—their recommendations will swell your TBR list! 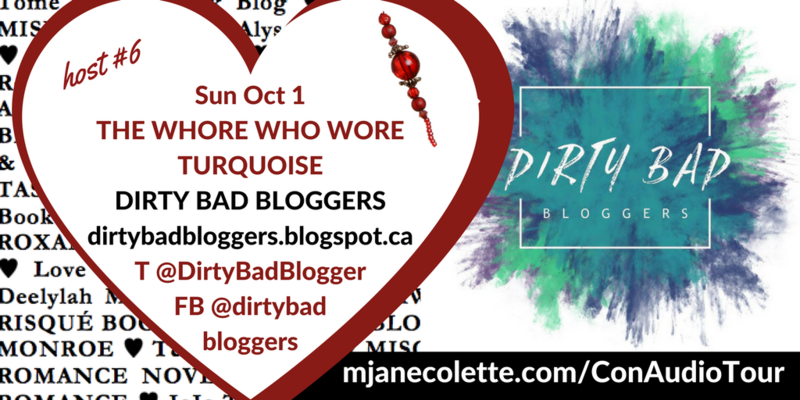 Connect with Dirty Bad Bloggers on Twitter, Instagram & Facebook–their FB page in particular is the place to hang if you want to keep abreast of all the free books and deals they monitor for their readers. I’m so thrilled they agreed to be part of the Consequences Audio Tour, and, as both Jenn and Morgan are into love triangles, there’s no better chapter for them to host than “The Whore Who Wore Turquoise”! Thank you, Jenn & Morgan aka Dirty Bad Bloggers!